grinding fluids which helps to prevent formation of solid blockages. Zinol Slideways Lubes are recommended for machine tool slideway surfaces, tables and feed mechanisms. 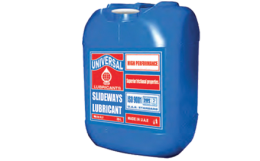 ZINOL Slideway Lube 100 & 120 is used for heavy loaded vertical slides. Provide strong adhesion to slideway surfaces. Provide rust and corrosion protection. Outstanding load carrying and anti-wear performance.